Information about the spatial structure of the transmission grid is relevant to understanding and predicting electricity prices, but this information has not been incorporated into empirical models of electricity prices in the literature. We propose the use of spatial econometric panel methods, discuss their formal characteristics in the context of electricity price data, and provide an application to a panel of PJM price data. Our econometric model includes a simple representation of the transmission system, and provides information about the effect of system constraints on the extent of electricity market integration. Empirical results confirm the existence of spatial patterns in electricity prices and illustrate their impact on estimation, forecasting, and interpolation. 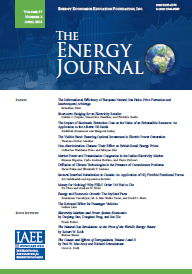 Proceedings - Are Competitive Electricity Markets Green?